Santorini is the top tourist destination in Greece and it is known all over the world for its unique natural beauty. The caldera with the white villages on top, the sunken volcano and the amazing sunset make it a popular place to be. You will find below our excursions suggestions for 1, 2 or 3 days on the island of Santorini Greece. 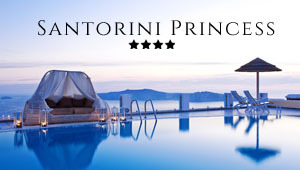 For a general idea, you can view the things to see and things to do in Santorini. The top thing to do in Santorini is to visit Oia, a picturesque village on the northern side of the island, to see the most romantic sunset in the world. Walk in the narrow footpaths and look at the shops. Oia is a favourite place for artists, photographers and couples. You will frequently see artists painting on the sides of the streets. Watch the incredible sunset and then have dinner in a lovely restaurant by the caldera. You can go to Oia by bus from Fira. Some people prefer to walk there but the distance is long, about 10 km. On the second day, you visit Fira, the capital of Santorini. This village is often described as a crowded place as it is the transportation hub of the island. However, it is still a picturesque place with all tourist facilities and a wonderful view to the volcano. Start your day with a coffee in a coffee place with view to the sea. Then, you are suggested to visit the Museum of Prehistoric Thera, which actually exhibits findings from Akrotiri and other excavation sites on the island. This museum presents daily life and culture on Santorini in the Minoan times (about 1300-1600 BC). It is a small museum, so the visit must not take more than an hour. Rather go in the morning because in the afternoon it will probably be closed. A visit to Santorini is not complete without a visit to the volcano. Frequent tour boats leave from the small port of Fira and go to the Volcano. Tours are usually guided and some include lunch. Otherwise, you can have lunch in Imerovigli, a lovely tourist village only 20 min on foot from Fira. On the third day, it is time to relax! Rent a car or motorbike and explore the beaches of Santorini. The most famous beach is the Red beach, but it can be very rocky for some people. Other popular beaches are Perissa, Kamari and Perivolos: organized, with clean water and small pebbles on the shore. You will find small taverns by the beachside to enjoy fresh fish and seafood. In July and August, these beaches are usually very crowded, but because of their large size, you will always find room to lay down. Pebbles on the shore have black and red colour, due to the volcanic activity.